With its astounding and intricate dancing and amazing choreography, the Philadelphia Dance Company (PHILADANCO) brought great pleasure to the audience at the Quick Center last Friday. Fairfield University hosted PHILADANCO, founded by Joan Myers Brown in 1970, as it celebrated its 40th year with a quadruple bill of modern and classical dances. The show opened strongly with “Violin Concerto,” which included choreography by Mitch Myers and music by Philip Glass. Its success was due largely to its lyrical performance. Each intricate movement from the dancers reflected the pitch and height of the music until the audience could almost envisage the dancers as the instruments producing the sounds. They danced with intensity locked in soft and fluid movement. The sensitivity in the opening Concerto II contrasted with Concerto III, but its performance was no less impressive. At the end of Concerto III, the audience seemed to release a collective breath, signaling the end of a dance so intense that the audience sat in distilling awe. The intimacy of this segment was heightened by the beautiful lighting designs, done by Clinton Taylor. The vibrancy of the dancers was represented by bright and warm colors like orange and yellow. Somberness played through blue and violet settings. The program continued with a contemporary modern piece called “Cottonwool,” with music from Christopher L. Huggins. To the enjoyment of the audience, the dance piece was more playful and more percussion-based. Visual colors emphasized and changed with the speed of dance moves. Perhaps the best segment of the dance performance was the inventive execution of “Guess Who’s Coming to Dinner,” choreographed by Ray Mercer. Unlike the previous performances, the dancers used a prop that could either hinder or enhance their performance: a table. The audience watched in anticipation as the dancers weaved over and under the table that stood at least three feet tall. 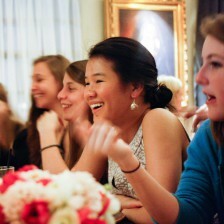 Any slight movement from the table could have been hazardous to the dancers, whose stability was grounded in the table. The table was also used in levels, where one performer danced above another. Thrilling the hearts of observers, the dancers successfully performed particularly dangerous moves. Music also added to the drama of this particular segment. The intermittent beats in “Dinner” allowed the audience to hear the breathing of the dancers, heightening the intimacy between the performer and the observer. The fourth segment with four works demanded laughter: cue the afros and white dance suits, and suddenly, the dancers transformed into partygoers of the 50s, 60s and 70s who came to enjoy a colliding mesh of funk music. This segment displayed the range of the dancers’ skill and energy, allowing their personalities to shine through with a loose, party-style number that had the audience clapping along to the riff-based soundtrack blasting from the overheads. 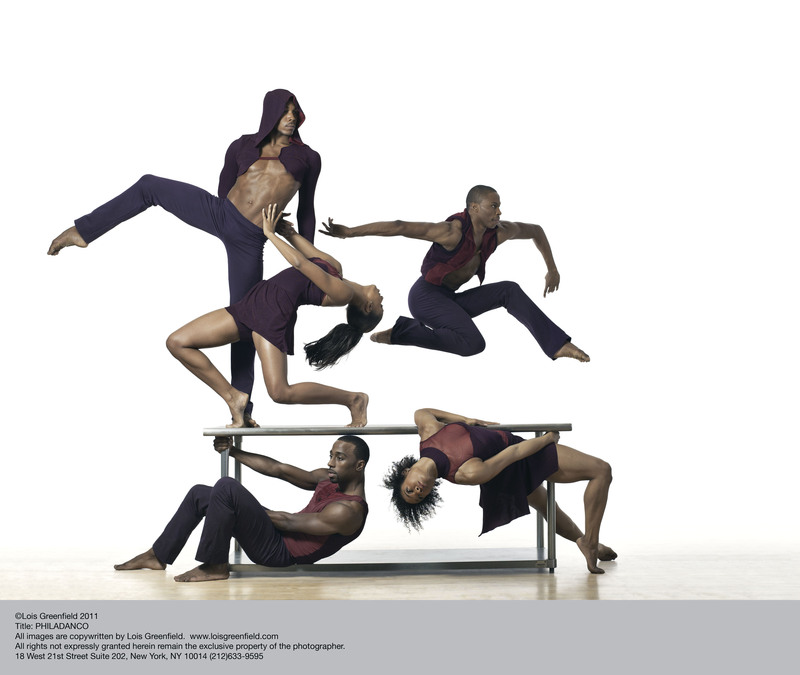 PHILADANCO continues to be celebrated for its innovation and fusion of classical and African-American dance traditions.